Hedge Trimmers are an invaluable garden tool when it comes to keeping shrubbery and hedges in the best looking condition. It's easy to let shrubs get out of hand if they are left for even a short while. Why struggle using outdated methods? Hedges and shrubs can of course be cut with a manual trimmer but it is so much easier and time efficient using a power trimmer. Dealing with just a few shrubs and hedges may not be a problem, but if you have a large garden with many bushes or detailed landscaping a reliable power trimmer will be required to keep things in order. 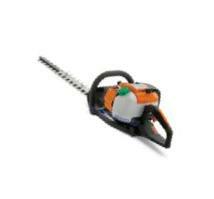 The hedge trimmer you decide upon will depend predominantly on the size of your garden and the kind of cutting you do. You can narrow down your options by asking yourself a few basic questions. Have you a preference for an electric, gas or cordless trimmer? What size blade do you require? How often do you intend to trim? Gas trimmers are the perfect choice for sizeable gardens that demand a great deal of heavy duty trimming whilst cordless trimmers are a good choice for smaller gardens and leave you free to move about. However, they may lack the power to deal with heavier work. Corded electric trimmers on the other hand whilst not offering the same amount of movement tend to weigh less and are far more economical. If you have a small or average size garden 16" or smaller blades are ideal, 18" blades can be used for average and larger areas, whilst 20" and larger blades are better for larger gardens. Generally speaking today's electric, gas or cordless trimmers are relatively quiet and very efficient in operation. As with all power tools, safety should by of primary importance. No short cuts should be taken here, read the user manual first and ensure you wear gloves and protective eyewear at all times. Trimmers are great tools and incorporate a number of safety features, that should include cutting the power to the cutters as soon as the trigger is released.